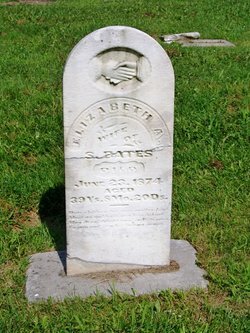 Today is the birthday of my 3rd great grandmother, Elizabeth Ann “Betsy” Blue. She was born on October 3, 1834 in Sangamon County, IL to Robert and Martha (Blue) Blue. Her parents were double first cousins: Robert was the son Robert Blue and Ann McNary; Martha was the daughter of John Blue and Elizabeth McNary. The Blue brothers married McNary sisters, then their children, Robert Blue and Martha Blue, married. Elizabeth was the oldest of their six children. Betsy gave birth to Dora on April 7, 1874. Eleven weeks later, on June 23, 1874, Betsy died at the age of 39. The cause of death is unknown because a fire in the Logan County Courthouse burned all the records prior to 1878. Betsy is buried in the Bluegrass Cemetery in Atlanta, Logan County, IL. Jordan Dodd and Liahona Research, comp.. Illinois, Marriages, 1851-1900 [database on-line]. Provo, UT, USA: Ancestry.com Operations Inc, 2005. Original data: Index compiled from county marriage records on microfilm located at the Family History Library in Salt Lake City, Utah by Jordan Dodd of Liahona Research (P.O. Box 740, Orem, Utah 84059). Specific source information is listed with each entry. I think that Dora b Apr 7 1875 was the daughter of Seymore’s 2nd wife Sarah Elizabeth Canady..